Rollright Stones England - Follow the Wow! Rollright Stones - Follow the wow! When we speak of following the light of your path, it often is hard to describe what that really means. Quite often to me, there Is only a subtle difference of what is the best direction. I never will forget through, the moment when I had my Wow – about my connection with stones and earth energy. It all started many years ago, when people – even complete strangers began giving me crystals. Within five years I must have been given about fifteen crystals and a few rocks without me ever suggesting to anyone that I liked them. All of a sudden crystals and rocks began to take over my house. I later found out that it is very common for crystals and stones to just “find you” if you are meant to have them. On my first visit to England a few years ago, I was fortunate to visit the English countryside for just one night. We had stayed in London for the rest of the trip, but took a day to go out to the countryside. As we ended up with a free morning, our hostess asked if there was anything special we would like to do. Well, we were in farm country, and there really isn’t much to do there in March other than to enjoy the beautiful country scenery. So I offered a suggestion. “I know we’re far from Stonehenge and Avebury, but I’ve heard there are all sorts of stone formations around England. 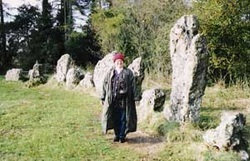 Do you have anything like that around here – especially any stone circles?” My hostess replied in the affirmative and my traveling companion was good naturedly up for it, so off we went. We ended up visiting the Rollright Stones, by Great Tew, which is an area that has a wonderful collection of about 70 small stones in an ancient stone circle. This was to be my first stone circle. When we arrived, there were several families visiting the circle, and while not crowded, there were a number of people enjoying themselves amongst the stones. My group walked in, and I immediately started walking the outside of the circle to connect and ground with the energy. Then I walked directly to the center of the circle where I felt a huge beam of light come down around me and connected me to the center of the earth. I felt unconditional love, saw speckles of gold light showering down and yelled to my friends “you haveto come into the center and feel this!” They did join me, said they couldn’t feel anything, but then also said it was very obvious that I could. When I looked out to the edge of the circle, I suddenly realized that the fifteen or so people, who had been in the stone circle with us, were just no where to be seen. Only the three of us were there together, alone, to share this exquisite experience. This visit really started my conscious exploration and fascination with stone circles and I guess also for sacred sites. The experience was definitely a Wow for me. But that’s how it works when I follow my light. It may be cards, pendulums, stones, becoming psychic, having children, it may be your work, a hobby, music or connecting with people. and you will discover your Wow and be living the life you are meant to enjoy.